When I released my first book four years ago, I wasn’t convinced I needed an author site. After all, an Amazon Author Page includes most of the basic elements needed to establish a web presence, and it’s free to boot. I decided to build one anyway for the experience I’d gain in doing so, and now it’s time for a major rebuild. Here’s why. As in every other aspect of learning how to self-publish, there’s an endless amount of low-value (and sometimes downright wrong) “how to” stuff out there, as well as an infinite number of service providers that care a lot about getting your business, but little (if at all) about helping you get business. They’ll be delighted to sell you a formulaic site, take your money and say “good luck” (others are very good, by the way, so shop around). Finding the straight story about what’s worth doing and what is simply a waste of time and money is a challenge and a chore. In point of fact, having a simple, static web site is likely to have little to no value at all. So paying hundreds of dollars to set one up, or spending a lot of time to figure out how to do it yourself for free, will be right up there with buying a press release – an almost complete waste of time and money. At the other extreme, setting one up and going wild with it, but in the wrong ways, may be an even larger, unproductive time sink. As usual, there’s no single “right” way to make your site work for you, because some people are better at making the most of the tools that others may struggle with. For example: a few authors have been able to make Twitter work well to promote sales, but I will never be one of them. The same goes with a web site – some options you can build into a site (like a blog) will be productive for some authors, but not others, or may attract followers that never buy your books. With that by way of prelude, here’s what I’ve learned after going on five years of effort trying to learn how to succeed at self-publishing. It must provide a clear, compelling reason for a visitor to buy each of your books, and make it as easy as possible for a visitor to make an impulse buying decision (e.g., include buttons linking to your book or author page at each major distributor through which your books are available). It should help build your brand, which includes you as well as any sub-brands it would be smart to create (e.g., specific book series and characters). Along with related promotional activities, it must help you establish a growing number of identified followers with whom you can communicate, both independently as well as via posts at the site. That way you can let your readers know when you release a new book, and hope to enlist them to help you promote it. It must be easily discoverable by people making appropriate web searches. Everything else about the design and your use of your site should consciously serve these objectives. That means resisting the temptation to use your author site as a platform for other types of activities that could detract from achievement of the main goals, or dilute, the core messaging. Many author sites (including this one) devolve into efforts to connect with other authors rather than acting as effective sales tools. Why? Because authors are more likely to interact, and it’s nice to be noticed. So the author starts to serve the audience they’ve been able to attract rather than continue directing their efforts to the more difficult goal of acquiring a reader base. If this is something you’d still like to do at your author site (as compared to having a second site for this specific purpose), here’s a way to have it both ways: add a separate “For Authors” tab at your author promotional site, and move your author blog and any related activities to that tab. In this way, it won’t detract from the essential sales function of your site, but it can significantly boost your site’s visibility and attract visitors that will then see your books prominently displayed in the side column. This site has attracted more than 29,000 visitors to date, all of whom might never have been exposed to my books otherwise. So let’s take it the next level down. What types of features should your site include? Obviously, your books should be very prominently displayed. Those authors that don’t have lots of news and opportunities for engagement to update should be sure that their books are the most prominent elements of the home page. I said “obviously,” but surprisingly enough, there are many author sites where this is not the case. You should tell your readers enough about yourself to allow visitors to connect with you as a person, since the person that writes the books is – or should be – part of the brand in order to permit your brand-building efforts to be as effective as possible (again, not as obvious as it sounds). If you are a fiction writer, consider making the style of your bio hip, flip, provocative, confessional or whatever in order to support the particular brand image that you want to create (that’s another serious topic, but one for another occasion). In any event, the text that introduces her to her readers shouldn’t be something appropriate to embed in a resume. If you want, you can stop here. But you can take this a lot further with a blog in which you share insights about, for example, how and why you write what you do, and what may be coming up next (much more on this topic to follow). Further to the same point, the banner of the site should feature your name, and not that of a specific book or book series (in some cases it may make sense to have a separate site to best build the brand for a series). For each book, the site should have a separate page, with a description, large size image of the cover, as well as other features of the author’s choosing, such as outtakes from reviews, references to prizes the book has won, endorsements, etc. But keep each book page short – no more than a screen or so. If you want to include more, do it via links to additional pages or sources. And, of course, include those Buy links. Include sample chapters from each book, with more Buy buttons at the end. Include a newsletter sign-up form in the side bar on every page, as well as invitations to use that form (with links) wherever appropriate within the main body of other pages. Never use your home page as your blog page. Put that under a separate tab. Keep the structure of the site and the navigation clean and traditional – make it easy for a visitor to find what they’re looking for by putting things under tabs with titles they’re used to. The features mentioned above are hardly exhaustive of those that can be productive, but remember that anything else you add should support and not distract from the central purpose of the site. As a general proposition, keeping your site lean in order to be effective is likely to be a good call, and time browsing the sites of successful authors will be well spent, not only in order to pick up good ideas but to test whether your own plans are likely to be effective. If you’re looking at this site before I cut over to the new one, you’ll see that my original design (actually, version 2.0 of my original site) violates almost every single one of the rules I’ve laid down above, reflecting my original observations: most of what I read when I set it up provided me with bad information, as well as my failure to be self-disciplined in the way I used my site. In some respects, it also reflects the fact that what makes an author site work has only gradually become obvious. Now let me personalize this a step further. Simply maintaining a web site that is well designed is not enough to guarantee results. It will be your other promotional activities (with the exception of your blog, if you have one at your author site) that will drive traffic to your author site. And it will be how you use your author site that will allow you to build a following from those that do arrive there. Traditional promotional techniques can all be deployed to the same purpose, but most offer the opportunity to create only remote and tenuous connections at best. Once you’re successful and well-known, Facebook can be great tools for keeping in touch with fans, and Twitter can suddenly become an effective way to spread the word with only modest effort. But they’re not so good for building that base. Most of what you are likely read about the value of building a newsletter list focuses on being able to tell old readers when you are about to release a new book. That should certainly be goal number one, but it falls short of the full potential of what reader engagement can accomplish. Making your books visible to potential buyers is an almost impossible challenge. In my day job, I’ve found that the more reliable way to get a new client is through a referral from a happy existing client. So if I can succeed in enlisting people who have enjoyed my books to help spread the word, the leverage potential is great, and the benefits should compound over time. Here’s how I hope to make that happen. The new site will include a tab called “Friends of Frank” (referring to Frank Adversego, the main character of my first two books and current book in progress). When you click on it, you’ll learn that you can get a password to access additional parts of the site. The newsletter form will have a check box to become a FoF as well. So will the last page of each of my books. Read each chapter of my current work in progress. Make suggestions for where the plot should go. Help me out by suggesting factual, consistency and other corrections. Read blog entries visible to them but not others, such as inside information about the characters, why this or that is happening, pictures of the actual settings I had in mind when I wrote a chapter, early looks at covers (and the ability to vote on alternatives). Buy an autographed paperback copy of the book at cost. Trade comments with other FoFs. Address questions to Frank or other characters, which will be answered in character. To buy an eBook copy of the book when it’s released at a $0.99 discount during the first week after launch in order to boost the book’s Amazon rank, and to credential their review (see next point). Post a review at Amazon (and GoodReads, if they are a member). If she likes the book, expend a little time spreading the word that the book is a fun read, using whatever means she’s comfortable with (e.g., conversational, Twitter, Facebook, whatever). I’ll make it clear that I’ll never know whether a given FoF does or doesn’t follow through, so this is a handshake, not a contract. If this sounds like an old-fashioned fan club concept updated to take advantage of the expanded capabilities of the Web, you’re right on target. That’s not a failing, but a virtue: it’s a technique that’s been proven time after time to work. The art of this technique will be in the execution, as well as its use by an author of a genre of books where this type of connection makes sense. Happily, there are a lot of genres where it should be dead on target, including mine: Mystery/Thrillers. I’m hoping that this will provide a means to build a community around my books, in the same way that communities have been built for so many other purposes. In other words, rather than feel simply like independent, isolated readers, at least some FoFs will become invested in the success of the books to the point that they will want to play a part in achieving that success, and will feel good if that success is achieved. I’m convinced that we are only partway through the transition from traditional publishing to self-publishing, and that new promotional methods are badly needed for authors to become visible and succeed. This will be my latest experiment in that direction, and I’ll let you know how it goes. Hopefully, you might decide to become a Friend of Frank yourself. Look for the new site before the end of the year. And, as always, your comments, reactions and suggestions are most welcome. 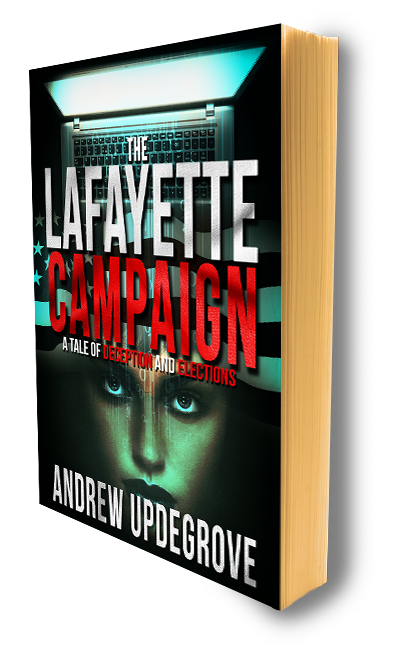 Have you joined The Lafayette Campaign? I'm a cybersecurity thriller author/attorney that has been representing technology companies for more than thirty years. I work with many of the organizations seeking to thwart cyber-attacks before they occur. This entry was posted in Blogging, Promotion, SelfPublishing, Writing and tagged Blogging, promotion, self-publishing, Web Promotion, writing. Bookmark the permalink. A few really interesting points in this post. I’ve been seriously contemplating doing a very similar type of move with my website. I don’t think my readers much care about the ins and outs of Amazon, but I, like you, have a lot of authors following my WordPress dot com blog, so some of my most successful and shared posts have been author-centric. Rather than leave them behind, I’m thinking of maintaining two blogs. Good luck with your Friends of Frank idea! I’m glad you found this worthwhile, and good luck with your separation plan. I think that the morphing of author sites into “authors” sites is kind of interesting from a psychological perspective. When an author is trying to get anyone to notice and buy their books, getting any sort of recognition (blog followers, comments, etc.) fulfills a need to have the author’s efforts be recognized. The challenge is not to get diverted, and pour all of your energies into something that seems to “work” but actually doesn’t, if the author’s real real goal is to get readers for their books and not their blog entries.. I should note that when this does happen it’s not actually bad. Most of us are never going to sell many books anyway, so becoming part of a supportive author community may be a more realistic and rewarding result in its own right that will be more than enough. Turning to the psychological side again, it could even be a healthy recognition that what an author might have originally been seeking (success as an author) might have been unrealistic, but that looking at writing as a hobby could be very rewarding and much more attainable. A lot of good tips here I wish I had been exposed to much sooner. I like the idea of getting your readers involved in your wip. I can see this really paying off for authors who already have a bit of an audience. I’m very curious to see whether it works as well. Unfortunately, because I haven’t had a newsletter list in the past, I won’t have a way to connect with a lot of my existing readers. But this will be a start, and better late than never. I’ll also kick things off by posting the first few chapters in the open so that current readers of the blog will get a chance to see whether they’d like to join in to follow further. Some excellent advice, well thought out and clear direct for the reader.. Thanks – I appreciate that coming from a Master Marketer! You are really thinking out of the box Andrew – some amazing ideas. Thank you for sharing them. Thanks, Lucinda. My guess is that there are other authors that this would work better for (romance authors, for example, might be a natural), but I plan on giving it my best shot. As usual, it’s easy to see how much effort you’ve put into this venture Andy. There’s a lot of good stuff in the article and it’s good to see you’ve mentioned the separation of blog and author site. I have my author website, my creative writer and artist website, and my ‘writing’ blog, and they are all interconnected, but one is not a substitute for another, and you said something along those lines. The one area I’ve considered but never got into is the newsletter idea, and I think it’s mainly because it’s so time-consuming. I don’t visit other blogs often enough, and I have so many plates spinning already, it would become a headache. Thanks, Tom. On the newsletter side, the prevailing wisdom is that an author newsletter should be used very sparingly – really just to announce new book launches – so that you don’t take advantage of readers with too much email, and so you don’t undercut the impact of an announcement when you do send it (e.g., no “wallpapering”). A common variation that I’ve seen is a promise not to send an update more than quarterly. As you can tell from my lead-in, I don’t think that there’s often much wisdom to be found in the prevailing advice line, but in this case this makes sense to me. So the point I’m trying to make is that if you use a service like MailChimp, other than adding the functionality to your site, there’s no required work to do other than an announcement of a new book when you’ve got one in order to realize the benefit of this approach, so this wouldn’t be a big new burden to add to the existing marketing stack. The right way to look at it, in my view, is that you want to have as many levels of engagement as possible so that each reader can pick the one it wants. No contact other than a new book announcement; sign up for an email notice of every blog entry; or go all in and become a Friend of Frank. Nobody has to do any of them, but the author has provided as varied a menu as possible in hopes that one of them will do the trick. A really thought-provoking, idea-inducing post. Thank you. I’m brewing up to revamping the look of my blog and you’ve given me some very practical ideas. As ever, you are so generous with your research. My pleasure, and good luck with your own updates. Thank you. It will happen. Eventually … Looking forward to seeing what you do with your site. Best of luck with this, Andrew. I’ll be keeping a close eye on it! This post gave me lost of ideas. Thank you for sharing. I’m glad, Lynette. I’m finishing up the new site, and hope to have it rolled out next week.